We’ve all done some pretty absurd things in the name of “proving ourselves” to our friends and families, haven’t we? From the playground to the high school halls and beyond, there’s something within each of us that seeks approval from someone – anyone – and acceptance. I’m not a guy (shocker), but I can only imagine that there is pressure in society and within social circles to be “manly.” Men, by the world’s standards, are expected to be able to accomplish certain tasks, earn a particular amount of money, and be fearless. Guys joke with one another that certain activities are indicative of “man cards” being taken away. Men and women both seem to encounter these pressures and struggles from members of their same gender, and this week’s episode of New Girl finds Nick Miller attempting to prove his manliness to Coach and the rest of the loft crew by means of camping in the woods for Thanksgiving. Nick Miller is a complex human being. No, he really is though: he wants to mature and evolve, but doesn’t quite know how. He cares a lot about Jess (one might even argue that he loves her), but he acts like a child. He wants to grow up, but he also wants to continue his old single lifestyle of drinking and being carefree. Nick is wonderful and so deeply human and flawed that it makes it all the more endearing when he attempts to prove something to his friends, to his girlfriend, and – ultimately – to himself. He’s on a constant journey of learning to evolve, but also knowing what he is. Nick knows that he’ll never be as outdoorsy as Coach. He’ll never be as wealthy or secure as Russell. He’ll never be as optimistic Paul. But there are weeks where Nick genuinely TRIES to be these people because those are the kind of people that he thinks Jess and the world admire. And every week that Nick tries to do this – to be someone that he is just NOT – we see how it always ends in disaster. Because it is one thing entirely for Nick to want to have a checking account or be a hunter. He might be able to succeed if he was attempting those feats to “better” himself. But Nick doesn’t do things because he’s trying to become a better version of himself. Not really. He does them because he’s AFRAID. He’s afraid of losing Jess. He’s afraid of losing credibility or reputation with his friends. And the root of his fear ultimately is pride. And pride is never a wise place to act from. This all may sound, of course, like I believe everything Nick has attempted to do this season has been out of a selfish or prideful place, either in regards to Jess or his friends. That’s not the case, obviously. I believe that Nick is, deep down, a guy who has everyone’s best interests in mind. He is, after all, the dysfunctional glue that holds this dysfunctional group together. Nick acts heroically and selflessly in “Thanksgiving III” when he realizes that Jess is in danger toward the end of the episode. He cares for and loves her like any good boyfriend would do. But that’s AFTER he realized that the reason they had been in that mess in the first place was because of his ego. So while I believe that Nick is not an inherently selfish person (like, say, Schmidt), I DO believe that Nick is an inherently insecure person. And insecurity and pride are two vices that are quite inseparable from one another. Nick may not always make the correct initial decision, but he always remedies the situation. He apologizes profusely in the episode for ruining Thanksgiving. But he doesn’t just stop at apologies – he actually makes it up to Jess, because that is who he is. He’s the guy who hurts Jess’ feelings but shows up at her school or makes breakfast for her on the roof. But before we launch into any further discussion regarding Nick Miller’s characterization, let’s talk about “Thanksgiving III” as a whole! Jess agrees, but the pair then realize they’ll have to convince their other roommates to join them because Jess’ ONE request – and it’s not a difficult feat – is that they (she, Nick, Cece, Coach, Winston, and Schmidt) are all together for Thanksgiving. Winston and Schmidt immediately object on principle, while Jess reminds them that their indoor Thanksgivings the past two years have been less than ideal. Eventually, the two cave and the entire gang heads into the wilderness for Thanksgiving. Cece meets the loft gang at their camping spot, vocalizing her apprehension about spending the day with her ex-boyfriend and his friend and former roommate with whom she just made out. (Jess would be proud of my grammar.) And I really do love that Jess is excited about camping because it means spending time with all of the important people in her life. They’ve all had a crazy year, but the beautiful and wonderful thing for Jess is that they MADE it. Nevertheless, it is awkward for Coach and Schmidt who have yet to discuss the “Cece of it all,” and both appear taken aback that she is there to begin with. Both awkwardly breach the subject, Coach discussing how much he enjoyed the date while Schmidt feigns disinterest. What I truly enjoyed about this episode is the lack of Schmidt attempting to sabotage the potential couple. We experienced enough of Schmidt’s tendencies toward “sabo” last week, so it was refreshing for the man to reflect on his relationship with Cece in order to give some genuine advice to Coach on how to approach his relationship with her. Winston and Cece FINALLY get a story together this episode during which they bond over their lack of woodsy skills. Winston and Cece essentially handle the outdoors about as well as I would. I’m jealous that Cece has a solar-powered phone charger, though. Apparently Winston and Cece have one more thing to bond over as well: the fact that neither of them got a say in their camping trip. Winston complains that he never gets to do what HE wants to (which apparently includes a pottery seminar), and Cece is merely along for the ride because she wants to appease Jess. Our lovely little characters bond over this throughout the episode, and it’s quite fantastic. As Nick and Jess unload the car of the supplies, the latter notices something: Nick has not brought any of their food along with him. Baffled, Jess asks what, exactly, they are supposed to eat and Nick – ever the prepared (actually, he IS prepared with charts for each of the loft members on what is safe to eat in the woods) – gestures toward the wilderness. And then, in front of the rest of the group, Nick Miller gives a big motivational speech about how the camping experience will teach them what it means to be brave and to fend for themselves. It will bring them back to basics and the simple way that life SHOULD be. Finally, Nick insists, the trip will allow them to become closer as friends which… actually DOES happen. The entire group is skeptical at first, but since it seems like Nick has a plan, Jess is on board with her boyfriend’s plan and the others are as well. Coach, Nick, and Schmidt return to the notion that their camping trip will somehow “prove” their manliness and go off to hunt, while Jess, Cece, and Winston try to forage for food. A few things begin to happen while the men hunt: 1) Coach’s awareness and knowledge of wilderness life becomes more apparent; 2) Nick begins to let slip that the real reason for the trip is to somehow prove that he is a man, and 3) Schmidt becomes increasingly determined to prove his own “manliness” to Coach. 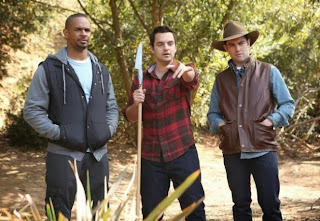 The trio never addresses their issues, however, which begins to escalate the problem as Schmidt attempts to one-up Coach and Nick builds a “bear trap” (see: a giant hole). It’s really only after Schmidt gets injured and then tended to by Coach that the truth begins to bubble to the surface and it all hinges on something the boys on this show are familiar with: pride. It is pride that destroys the relationships on this show (and in daily life, if we’re really being honest). And it’s pride that is the biggest vice present in “Thanksgiving III.” Nick attempts to defend his pride and status as a “man” by forcing everyone to go camping. He constantly tries to prove himself in the episode to Coach. And Schmidt does similarly – after he learns that Coach is actually quite skilled in the wilderness, his attempts to prove that he is better than Coach and a man intensify. Schmidt lost Cece because of his selfishness, and this season of New Girl has focused on Schmidt’s continued attempts to make himself a better person… or rather to PROVE to others that he has worth and value. It’s pride that hurts both of these characters in the end, however, and they quickly learn this truth. While the boys are arguing over who the best camper is, Jess is attempting to forage without the assistance of Cece and Winston who are on their cell phones. Winston locates a country store that is only a few miles from the campsite where they can purchase food, even though Jess continues to insist that she’s having fun scouring for berries. The truth, of course, is something Cece echoes: Jess thinks that Nick’s plan is a bad idea but is not willing to admit it to her boyfriend or herself. Nick and Jess have struggled (see: “The Box) this season when it comes to the way that they approach issues and I think that Jess is just afraid of breaking Nick’s spirit, especially when he so rarely becomes passionate about things. She’s trying to spare his feelings but in doing so, manages to actually HURT Nick’s feelings later in the evening. Jess ends up conceding and she, Winston, and Cece shop at the country store for food to bring back to the campsite. Nick, Coach, and Schmidt continue to hunt and Nick points out a fish in the water that he can easily catch. Unfortunately, even after Coach and Schmidt’s warnings that the fish is dead and the water probably isn’t safe because of it, Nick enters the river and continues to shout back to the other two men about how “manly” he is for catching the fish. Coach makes a face that clearly indicates that he knows the purpose behind their camping trip, and it isn’t to bring everyone together. But the man has his own issues to deal with, namely with Schmidt, as the latter continues to attempt to prove his own manliness. Nick, in the water, admits that the reason he’s behaving the way that he does in the episode is because of Coach’s teasing. I think it’s good that Nick admits this to both himself and to Coach and Schmidt, actually. It doesn’t alter the way that Nick behaves (he’s still full of pride and ego), but it IS a good acknowledgement. My friend Kate and I were discussing Nick’s behavior in “Thanksgiving III” when she admitted that she didn’t like Nick much in the episode. She explained that she likes “new Nick,” but when he regresses into a more self-absorbed, juvenile character that is representative of the first two seasons, she finds him to be more unbearable. I’ve heard this criticism of Nick quite a bit, to be honest, and that’s why this character is so complex. We, as audience members, want to see Nick as evolved and mature in his relationship with Jess. We enjoy the fact that he’s taken on more responsibility this season. We do not enjoy seeing glimpses of “old Nick,” as it were: this man-child who constantly tries to prove himself to everyone else, who is a curmudgeonly alcoholic with responsibility issues. It’s uncomfortable and disconcerting for us to see relationship!Nick act like single!Nick did. But I’d argue that, though a thin line to walk in writing his character, this dichotomy – the struggle between the old and new version of himself – is exactly WHO Nick Miller is. He’s crazy about Jess, but he’s still insecure. He’s evolving but he’s still immature. And he’s sweet and caring, but he can also be egotistical and selfish. The truth is that Nick Miller may never completely grow up, and that’s something we, as audience members, have to accept because that is WHO Nick is. He’s never going to be Prince Charming and we shouldn’t expect him to be. The fact of the matter is, though, that he is GROWING. Growth means that sometimes you slip up and retreat into your comfort zone even if it’s wrong. Growing up means moving forward from where you are, but sometimes in order to get there, you have to take a few steps back in the process. I love Nick Miller with all of his weird issues. And though I’d love for him to be the kind of man who brushes off Coach’s remarks and doesn’t let the comments of his friends bother him, I doubt that Nick will ever completely get to that point. And that’s FINE. Because as long as he recognizes the errors of his ways (as he does at the end of the episode), and tries to amend his behavior (as he does at the end of the episode), then that’s all I really want. I don’t mind Nick being occasionally selfish or immature, so long as it leads to character growth and not stagnation. At the campsite, Jess, Cece, and Winston are setting up the food they purchased while attempting to make it look like they found it in nature. Coach and Schmidt are immediately skeptical of the display, while Nick – oblivious for a few moments at least – commends them all on their ability to fend for themselves in the wilderness. … Until, that is, he picks up an apple to eat and notices the sticker on it. While Jess encourages him to sit down and enjoy a meal with everyone, Nick’s feelings are evidently hurt and he stalks off to cook his fish by himself. Schmidt and Coach continue to compete for the title of “best camper” (though when Coach effortlessly lights a fire, it’s not much of a competition) while Jess attempts to coerce Nick back to re-join the rest of the group at dinner. Jess, being the wonderful girlfriend that she is, can see that Nick is disappointed in himself and his plan, so she begins to praise him for coming through for the rest of the group, for catching a fish, and for making the decision to go camping. But Nick catches on and suspiciously asks what she’s doing by extolling him. When she explains that she’s glad he provided for them all and is a man, he accuses her of patronizing him. It is then that Nick explains the real reason for their camping trip and for his recent behavior: he feels like he’s lost himself in their relationship. It’s a startling confession, really, because we haven’t seen much evidence of this fear in Nick lately. And if there is one critique I could give of the episode, it is that this admission doesn’t seem to have stemmed from anything deeper than Coach’s comment at the start of “Thanksgiving III.” I suppose one could argue that Nick’s selfish behavior this season (see: “The Box”) is what he refers to, but I am not entirely sold on that notion. But I love this moment, however disgusting, because it shows the lengths to which Jess is willing to go in order to prove how much she cares about and supports Nick. She could have easily walked back to Cece and Winston, continued to prepare their meal, and hope that Nick would come to his senses. It would have been reasonable for her to leave him on his own, after all. But she DOESN’T. It’s a really nice parallel, too, to “Nerd” where NICK is the one who explains that if Jess is going to do something dumb, he’s going to be doing it right beside her. Jess and Nick? Theirs is a kind of “ride or die” relationship and no matter how dumb things get, she has his back (“Chicago”) and he has hers. Jess goes off into the woods and begins to hallucinate (she has mercury poisoning from the fish, among a few other things Nick notes later on), while the rest of the group – worried – begins to go look for her. Nick admits that it is all his fault and then admits to Coach that he LIKES doing girly things with Jess and he LIKED that Thanksgiving invitation. Coach is a bit confused, but it doesn’t last long once the group sees Jess in the distance. Unfortunately, at that moment, Coach recognizes the tree that Jess is walking by and yells out to her because she’s about to fall into Nick’s bear trap. In response, Nick dives (“Head first? Why?”) into the hole with his girlfriend, which is both a comedic and completely endearing moment. If Jess hurts, Nick hurts. He may not always make the right decision, but he ALWAYS rescues her from the dumbest or most perilous of circumstances. He IS a man, but not because he can hunt a fish or build a campfire or survive a weekend in the woods. He’s a man because he takes care of his girlfriend. Remember in “Nerd” when Schmidt, upon seeing Jess passed out on Nick’s bed after a night of drinking, insists that Nick needs to take care of Jess? It is then that Nick explains that she’s his “old woman” and that he IS taking care of her. He may not be conventional in his methods or means, and sometimes their adventures may be absurd, but Nick doesn’t recognize that his manliness comes from the way that he loves Jess unconditionally and is willing to do anything – no matter how stupid – to prove he cares. Including diving head-first into a hole to rescue her when she’s delusional and hallucinating. Once in the hole, Nick profusely apologizes for his behavior and for ruining their Thanksgiving. But Jess is still under the influence of the bad fish, so she’s not really coherent or listening. The rest of the group looks down on the pair and strategizes how to rescue them. When Coach approaches Schmidt for ideas, the latter accuses Coach of patronizing him. He then admits that Coach is probably better at a lot of things than he is, including dating Cece. But… that’s not quite the case. Coach actually explains that, while he had a great time with Cece, she’s been ignoring him all weekend and he’s unsure of how to proceed. This brings Schmidt joy, actually, to hear of Coach’s struggles. And while I waffle between the reasoning (either Schmidt is happy that Cece appears disinterested or else just happy that Coach isn’t perfect at everything), the point of the B-story seems to be that neither man has it all together. While Schmidt is obviously messed up and broken and still seeking approval from the people around him, Coach isn’t perfect either. Unfortunately for Schmidt, he cannot hide his glee at Coach’s news, and then the two begin to fight. Cece breaks them up by demanding that all of the men drop their pants so that she can use them to create a rope and lift Nick and Jess out of the hole. (Way to go, Cece, for being the most logical one out of the group!) Together, Cece, Winston, Coach, and Schmidt manage to lift Nick and Jess out of the hole. Yay! Unfortunately for Nick, while celebrating, he falls back in. Whoops. In the waiting room, Cece and Winston are presumably bonding over chips in the vending machine, while Coach and Schmidt sit beside each other with Coach watching Cece. Schmidt notices and decides to give Coach (arguably selfless) advice: pursuing Cece isn’t an easy feat. Coach has had a lot of things come easy to him, but a relationship with Cece won’t be one. As Schmidt reminisces about how difficult it was for HIM to pursue her – and discusses a time she essentially ignored him – he can’t help but smile. It’s kind of an adorable moment, really, because it exemplifies Schmidt’s selflessness and also the fact that he cared about Cece and being with her, even when it seemed like he never stood a chance. Nick bursts into the waiting room with a new plan (everyone groans and objects) to save Thanksgiving. But Nick’s plan this time is actually an adorable one – he and the rest of the group enter Jess’ room with various vending machine snacks, makeshift decorations, and the parade on Winston’s phone. Jess wanted them all to be together and eat a meal with each other for Thanksgiving. And even though it’s weird and wacky, it is essentially THEM. The woman smiles and is genuinely happy because no matter what circumstances surround them, she is glad that there are people in her life that care about her and love her, who are crazy and random and weird but who she can call HERS. And that, dear friends, is something to be thankful for. Great Review! also, I think Schmidt was happy about CeCe's lack of interest though he recognized in the hospital that Coach is trying to be a good guy to Cece and a good friend to him.